In recent times, It has been observed that beautiful actress, Nkiru Sylvanus, has been saying it openly that she can become a second wife if the man truly loves. But what we didn’t know was that, it seems her words were inspired by the fact that the man who was supposed to marry her but was snatched from her by a fellow actress, Oge Okoye, might be coming back to take her as his second wife. It’s no longer news that Nollywood darling actresses Oge Okoye and Nkiru Sylvanus are involved in one of the biggest scandals from last year. Nkiru Sylvanus is currently engaged to her colleague Oge Okoye’s husband, Stanley Duru. They would have been married by now if not that their story was made public and the couple was forced to pause their wedding plans. 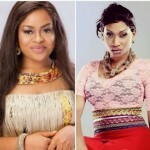 “It is funny how the media is blaming Nkiru when it is actually a complicated affair. Oge and Nkiru used to be close friends, they met Stanley at the same time in Enugu in 2006.
sheepishly let Stanley impregnate her. Nkiru was hurt but she let go of the love of her life for a friend, she didn’t want her to be put to shame and mocked for having a child out of wedlock. So, Oge Okoye and Stanley Duru moved to Amsterdam and got married. Of course a dog will always return to its vomit, after having their first son, Oge cheated on Stanley with a friend of his and he paid her back by dating one Dutch lady, Barbara with whom he now has a child, Uchechi, but let’s leave that story for another time. They somehow reconciled and she took in again and delivered a baby girl in 2010 but they officially parted ways in 2012, you media people didn’t know that, did you? Contrary to reports that Oge Okoye is unhappy with the development, the source claimed otherwise. The game isn’t over yet, keep your fingers crossed guys and we will keep updating you till the end.